ACE is the place where you can get everything you need for home improvement and daily lifestyle. For ACE, value is a combination of helpful services, quality products and best price. We offer established world class products from all around the world. You can get everything you need at ACE for your home improvement, hobbies and lifestyle. We have a lot of products for hardware, electrical, tools, cleaning, kitchenware, home decor, outdoor living, automotive, pet supplies, bikes, luggages and more. ACE has a customer loyalty program called ACE Rewards. Member's contribution plays a significant role in ACE's sales every year. ACE Hardware Indonesia's leading position in its field is due to the development of modern and solid network with quality products offering. 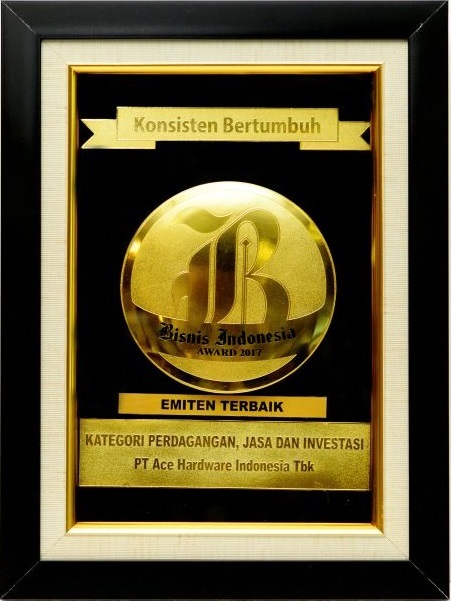 For the fifth time, ACE Indonesia managed to receive award from Indonesia WOW Brand. 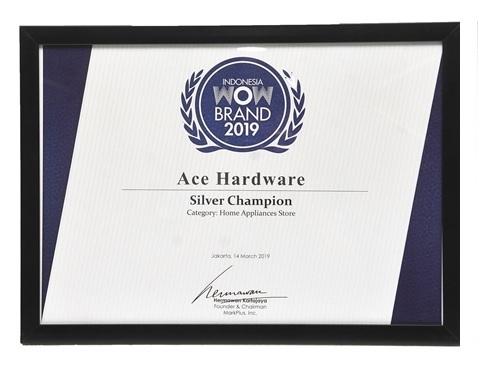 PT ACE Hardware Indonesia Tbk successfully entitled Silver Champion in the Home Appliances Store category in the Indonesia WOW Brand 2019 awarding night. 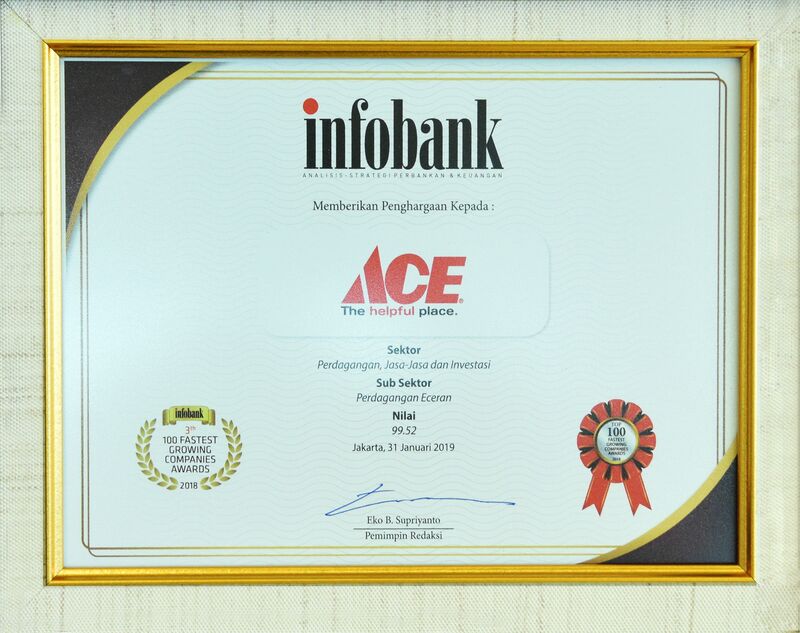 ACE begin 2019 by receiving another prestigious award from Infobank. For the third times in a row since 2017, ACE were awarded the 100 Fastest Growing Companies Award. It is an award given for companies with ability to grow and maintain sustainable performance through the harsh competition and challenges caused by 4.0 industrial revolution that were going on these last 4 years. 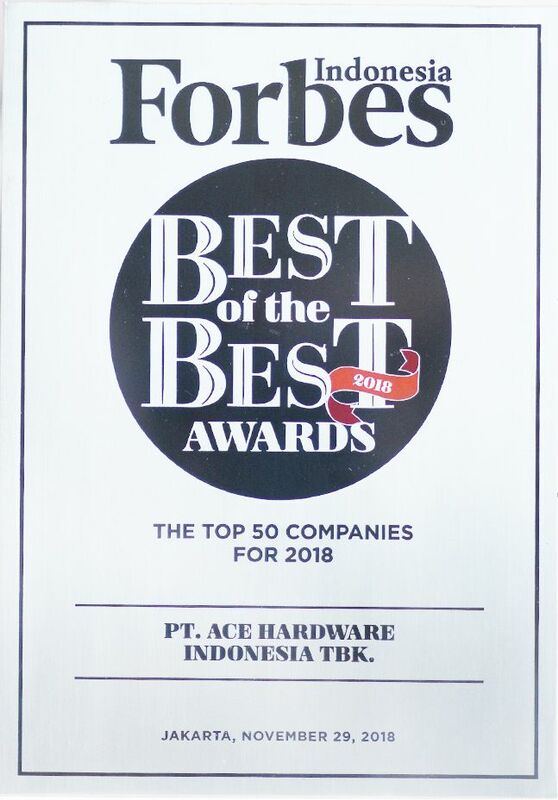 ACE perfectly end the year of 2018 by receiving a prestigious award from Forbes Indonesia - Best of the Best Award 2018. ACE has won the award for the sixth time in a row. It is an award given to 50 best publicly listed company with the most outstanding long term performance. Emiten Terbaik Kategori Perdagangan, Jasa dan Investasi. Host: Bisnis Indonesia. To achieve 20.000 blood bag collection target, Kawan Lama Foundation held blood donation program again this year at 18 ACE stores. An annual event held where all business unit under Kawan Lama Group give tree seeds to their customers. ACE is holding a raffle program with total prizes billions of rupiah from February to May 2018.